Glee is an American musical comedy-drama television series that airs on Fox. It focuses on a high school show choir, also known as a glee club, set within the fictional William McKinley High School in Lima, Ohio. 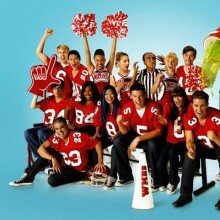 Glee features multiple major and secondary roles who have contributed vocals to the show: Lea Michele, Matthew Morrison, Dianna Agron, Cory Monteith, Amber Riley, Chris Colfer, Mark Salling, Jenna Ushkowitz, Kevin McHale, Naya Rivera, Heather Morris, Jayma Mays, Jane Lynch, Darren Criss, Harry Shum, Jr., Chord Overstreet, Ashley Fink, Dot Jones, Grant Gustin, and Damian McGinty. Numerous special guests have also featured on tracks, including Jonathan Groff, Kristin Chenoweth, Olivia Newton-John, John Stamos, Neil Patrick Harris, Idina Menzel, Charice, Gwyneth Paltrow, k.d. lang, and Ricky Martin. The pilot episode of the show was broadcast on May 19, 2009, and the first season began airing on September 9, 2009. The show was created by Ryan Murphy, Brad Falchuk and Ian Brennan. Murphy selects all music featured within the series himself, with the intent of maintaining a balance between show tunes and chart hits. Songs featured on the show are available for digital download through iTunes up to two weeks before new episodes air, and through other digital outlets and mobile carriers a week later. As of 6 October 2010, 113 tracks have been released as singles. Their debut single, "Don't Stop Believin'", a cover of the 1981 Journey song, was a top ten hit, and was certified platinum in Australia and gold in the US. The group's cover of The All-American Rejects' "Gives You Hell" reached number one in Ireland, giving them their first number one single. Three EPs have also been released: Glee: The Music, The Power Of Madonna, Glee: The Music, Journey To Regionals, and Glee: The Music, The Rocky Horror Glee Show. The cast is second behind The Beatles for most chart appearances by a group act in the Billboard Hot 100's history, and holds the record of sixth overall among all artists, with sixty-nine appearances. As of September 2010, the cast has sold over thirteen million songs and five million albums worldwide. The series' cover versions have also had a positive effect on the original recording artists, with sales of Rihanna's "Take A Bow" increasing by 189 percent after the song was covered in the Glee episode "Showmance". The series features covers of numerous songs sung on-screen by the characters. Musical segments typically take the form of performances, as opposed to the characters singing spontaneously, as the intention is for the series to remain reality-based. Murphy is responsible for selecting all of the songs used, and strives to maintain a balance between show tunes and chart hits, as: "I want there to be something for everybody in every episode. That's a tricky mix, but that's very important the balancing of that." Song choices are integral to script development, with Murphy explaining: "Each episode has a theme at its core. After I write the script, I will choose songs that help to move the story along." Glee is choreographed by Zach Woodlee, and features five to eight production numbers per episode. Once music rights are cleared, songs are arranged and pre-recorded by the cast. Woodlee constructs the accompanying dance moves, which are then taught to the cast and filmed. Numbers can take several weeks to prepare, depending on complexity. Each episode costs at least $3 million to produce, and can take up to 10 days to film as a result of the elaborate choreography. You can listen to music from Glee at the Official Music From Glee Website. Dear fans if you are reading this, you clicked on the subpage of the singer glee cast in our eLyricsWorld. Our database comprises with data about 52389 artists worldwide also 829824 songs 817 of which are from glee cast. Besides the singer's biography, on this page you can see short piece of information about them, enlists date of birth, style, record label Be versed in all the development with glee cast by adding RSS link. If you prefer you could directly visit the page you are on at the moment and see what's new and latest songs about the singer.